Zevia is a Los Angeles based soda company that specialized in stevia sweetened sodas: ranging from energy drinkers to colas to cocktail mixers. Zevia Tonic Water is their mixer aimed at the Gin and Tonic set. But this might be the right combination to work with stevia’s character. Tonic Water is intended to be a bit bitter— Stevia’s main draw back may be an asset when combined with quinine. 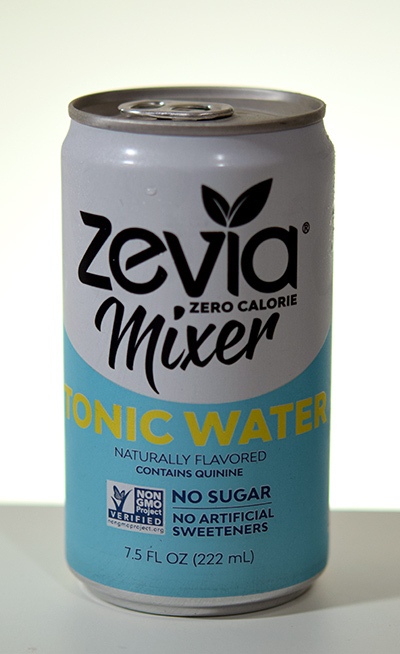 But for fans of lower calorie tonics, and Zevia Tonic Water is a legitimately zero calorie option, and one of the few that uses an alternative artificial sweetener. Poured, Zevia Tonic Water forms a robust, foamy head that’s surprisingly persistent— upon pouring, especially with gin— expect an eruption. The tenacious bubbles do eventually dissipate, leaving a disappointing amount of bubbles still in the drink. A couple geysers remain on the bottom of the glass, but there’s little evidence of carbonation left in the glass. The nose is pleasant with a slight lemon-lime soda note. On the palate, it’s somewhat lacking in texture. There aren’t a great deal of bubbles hitting the tongue, unless you sip Zevia Tonic directly from the can. Then you do get a bit of bubbles and at least a modicum of carbonation and texture. Tastewise, the bitterness comes on rather early. Metallic, with a hint of lemon-lime soda mid-palate, the bitterness continues, escalating gradually, but with very little— if any— quinine flavor. Zevia Tonic Water sits for a long time on the palate with a long lasting bitterness. I mixed up a Gin and Tonic with Sourland Mountain’s gin. The herbal spiciness comes through, especially early on the palate. It does a nice job of coming through and masking some of the bitterness. However, I find that on the finish, it’s the stevia bitterness that predominates, masking the finish of the gin. If you’re a fan of stevia soft drinks in general, I imagine you’ve made up your mind before reading this review. For stevia fans, Zevia tonic water is your ticket to a low calorie gin and tonic. But evaluated on its own as a tonic water, I find that the carbonation’s lack of persistence leads to a G&T that tastes rather flat right off the bat. Secondly, it doesn’t quite have the quinine bite that I’d like to taste in my tonic waters— the bitterness is the same bitterness you get when drinking a stevia-sweetened soda. There’s a dearth of quinine flavor here. Thirdly, and perhaps this is my perceptual bias— I just don’t think it tastes very sweet. Overall, if you dig Stevia, check this out. If you don’t, nothing here is going to change your mind. You can get Zevia Tonic Water from Amazon, for about $1/can in a 24 pack.